Grass pollen allergy is one of the collectively known allergies to pollen and manifests itself as a seasonal inflammation of the lining of the nose (rhinitis). In fact, it usually occurs in the spring, in March and April or May to July depending on the pollens and grasses that grow in these times. It also takes the name, in common language, of hayfever. In the presence of these allergens, the immune system of the allergic person will react by releasing histamine, a variety of hormone that will cause inflammation, predominantly in the nose. inflammation of the pharynx with an itching sensation. If the allergy is strong, it is possible that the reaction leads to more severe symptoms such as asthma or even anaphylactic shock (circulatory problems following a major allergic reaction). The diagnosis of a grass pollen allergy is based on family history and a medical examination. The doctor or allergist (a doctor specializing in the treatment of allergies) will look for ENT symptoms affecting the nose, ears, mouth, as well as the inflammation of the eyes or skin. There are also skin tests (or prick tests) used to highlight the allergens involved. They are particularly reactive in patients between 15 and 25 years. 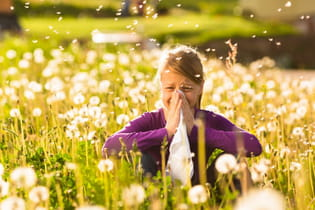 The treatment of the allergy first and foremost is to do everything possible to avoid contact with the allergen (which is highly difficult when it comes to grass pollen allergy). It is also possible to desensitize the body, to gradually make it accustomed to the allergen that is present in grasses. The solution containing the substance identified as allergenic is injected under the skin with an increasing dose over several months or years. The body learns to develop an appropriate response to the presence of these allergens. Some useful tips can help reduce an allergy to grass. Make sure to avoid the allergen. Although it is not possible to remain closed in at home, it is preferable however to not open the windows when it's windy (wind will carry the pollen in). Same thing goes for your car when you're traveling in the countryside. Original article published by Jean-François Pillou. Translated by Jean-François Pillou. Latest update on June 18, 2014 at 10:13 AM by Marjorie Gaulier. This document, titled "Grass pollen allergy," is available under the Creative Commons license. Any copy, reuse, or modification of the content should be sufficiently credited to CCM Health (health.ccm.net).